I’m planning to start teaching yoga in January and I’m not feeling ready enough. I go to three classes + one meditation class per week at Zing, where I’m training, go to Ashtanga class with another teacher when I can, and I do some at home, but a regular, rigorous daily practice is the best way to improve, learn, keep in the flow and further develop teaching skills through what you observe through your own experiences. Now that I’m down to one job and my schedule is less mad, I’ve resolved to be more focussed with my yoga practice. 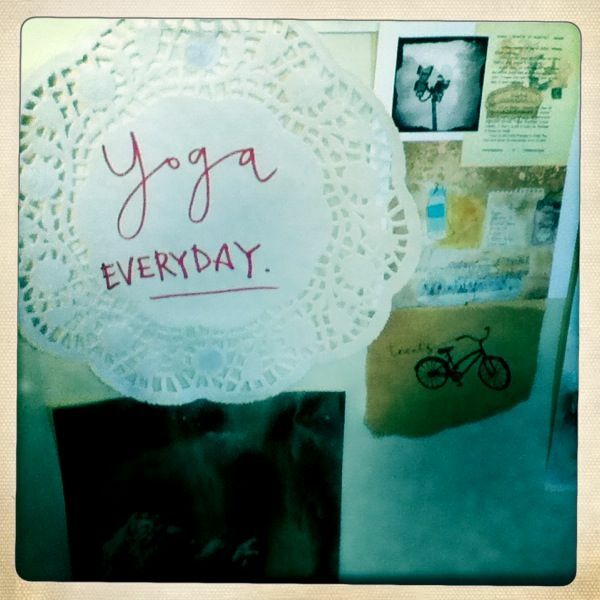 Yoga everyday. I won’t be teaching 16 hours per week, to begin with, I will be teaching just one class. Toe in the water. Baby steps. But I would like to have a daily practice for me. I’ve also been really inspired by my friend Tania Brady’s ‘Yovember’ experience. This month she has been doing Bikram Yoga every day, sometimes twice a day! I’ve found her reflections on how her practice has changed revealing and inspiring. Check it out HERE. Go Tania! ‘No one can steal your peace’ – I love that notion. It’s a very Buddhist notion, too. I have a daily yoga practice. Well, until a couple of months ago it was a daily qi gong practice, and by daily I mean six out of seven mornings. Most often its an intuitive practice where I start with a pose or series and then carry on with whatever occurs to me. When I have an ache or an emotion, I focus my session on releasing that. Some days its 15 minutes, some days its almost an hour, mostly somewhere in the middle. When I’m not very motivated I follow a lovely Shiva Rea CD I’ve had for years, or open a yoga book for inspiration. I haven’t been to a regular yoga class for years (tho I try and get a few Bikkram sessions in when I’m in Melbourne). So my form is probably a bit wack (though I try hard), and I don’t usually hold a pose as long as I would in a class and I am more likely to repeat my favourites and avoid great challenges. Its an undisciplined discipline that I practice. But I figure something is better than nothing, and a total of three hours of yoga over six days is probably better than one 90 minute class a week, and I wouldn’t go every week anyway because I like staying home. So my home practice is good enough and besides I love it and love the way it starts my day with positive energy. Hey Meliors, your home practice sounds terrific and just what I’m talking about. I think home practice is actually harder than taking off to a class. When you go to a class, it’s all laid on for you – at home, you have to find the motivation and think up the sequence, for yourself.